Home › BACON › SUPER SIZED FOOD FOR SUPER SUNDAY! IT ALL BEGAN HERE. 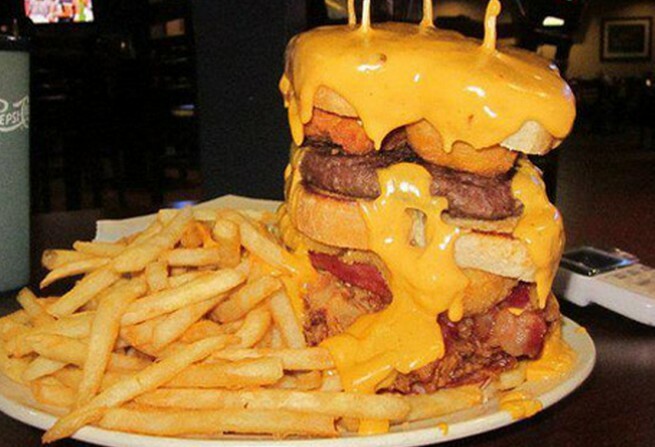 THE MAC’N’CHEESEBURGER. I didn’t create it, Nancy Silverton did. 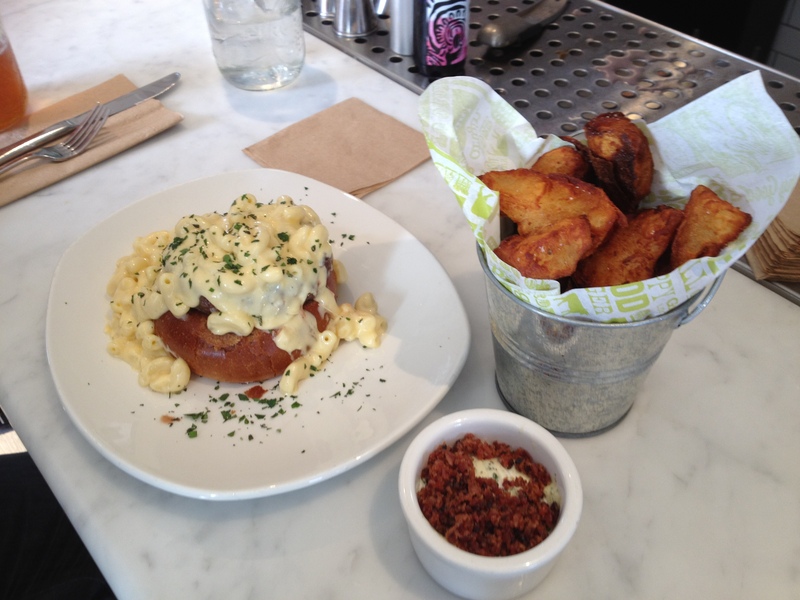 It can be found at “SHORT ORDER”, her new burger joint at The Farmer’s Market in LA. Anyone who goes regularly to the Market knows you can ge thte freshest produce, fruit, meat and fish – in a crazy retro environment of food stalls and souvenir shops. The Farmer’s Market also has the world’s largest collection of hot sauces, most with titles you can’t print in a family newspaper, as they like to say. Then came the mystery of the Fuku Burger that I had on Thursday with my son Jeff. 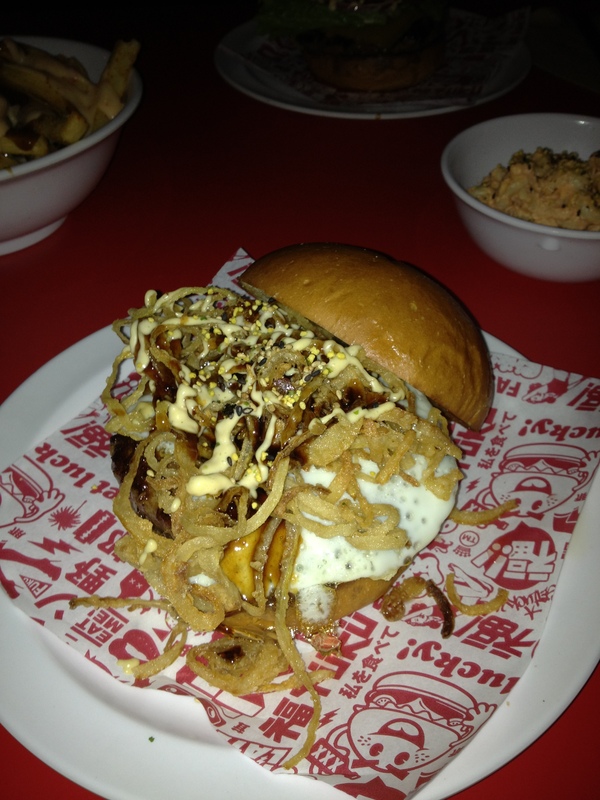 This looks HUGE, but in fact, it was a smaller sized bun, not a huge amount of meat – just topped with a fried egg, crispy onions and some japanese-influenced sauce. It was filling, but not HUGE – even though the picture made it look big. So I just decided to get it all out of my system and go big today. A cursory skim of the web led me to the following super-sized, impossible-to-eat-but-isn’t-it-funny-to-stare-anyway food items to share. After all, it’s Super Bowl weekend and aren’t we supposed to eat too much? THE SUPER BOWL OF SNACKS! 1,200: Average number of calories consumed during the Super Bowl. It’s the second largest day for U.S. food consumption. Only Thanksgiving day is more. 71.4 million: Estimated pounds of Hass avocados that will be consumed for the game this year, according to the Hass Avocado Board. That’s enough to cover Indianapolis’ Lucas Oil Stadium end zone to end zone in more than 27.5 feet in avocados. 1.25 billion: The number of chicken wings Americans are expected to eat Sunday, according to the U.S. National Chicken Council. 32: Percentage of U.S. grill owners who will be firing up on Game Day. According to Weber, the Super Bowl ranks as one of the top 10 most popular ” holidays” to grill. 325 million: Gallons of beer to be consumed. — 11.2 million pounds of potato chips. — 8.2 million pounds of tortilla chips. — 4.3 million pounds of pretzels. — 3.8 million pounds of popcorn. 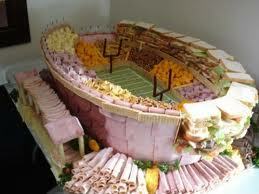 — 2.5 million pounds of nuts during their Super Bowl parties. The potato chips alone will account for 27 billion calories and 1.8 billion grams of fat. So there you have it: food, food – lots and lots of food. 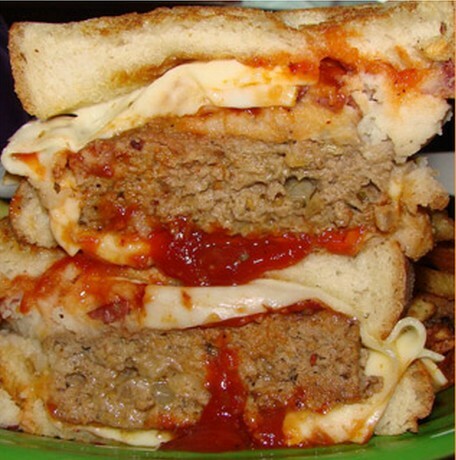 Here’s another example of excess for the sake of excess: Take three lbs of beef, cheese balls, hot wings, pork tenderloin and onion rings – turn it into a burger. Add a side of fries and you are good to go today – and tomorrow – and any other day you choose. This isn’t a rib-sticker, it’s a gut-puncher! Here’s one to drive the traditionalists mad – those of us on the West Coast know that In-n-Out Burger delivers a mighty tasty creation, and some people get all carried away with the stupid “Secret menu” – but I say, just order a burger and enjoy it. Here, they just couldn’t leave well enough alone. 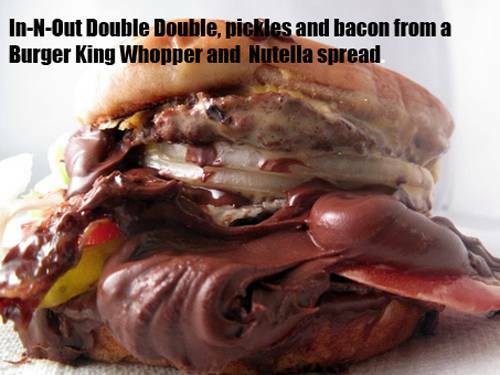 These bastards took an In-N-Out Double double and went to town on it – they bastardized it by adding pickles and bacon from a Burger King Whopper – and then added Nutella spread on top for reasons we will never understand – but someone, someday, will be held accountable. Vaz’s Takeaway in Sydney, Australia. We aren’t the only nation who likes to go big or go home. 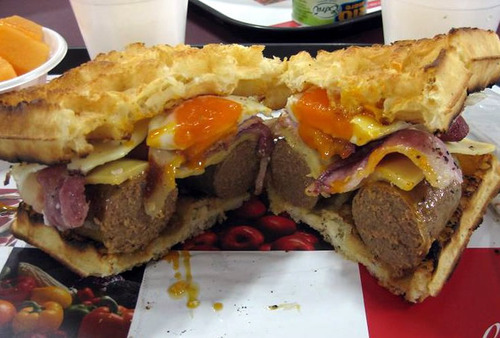 Thanks to Theberry.com, which has a ton of “huge food” pics to share, we have the offering from Vaz’s Takeaway in Sydney, Australia. 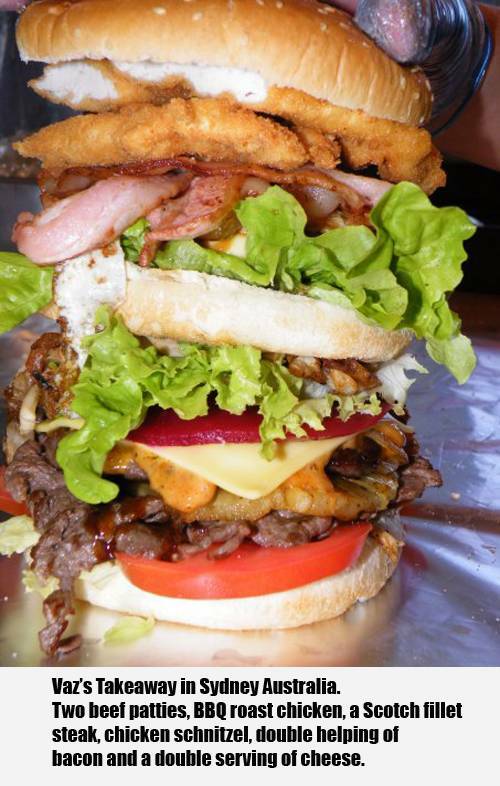 Our friends down under like to take two beef patties, BBQ roast chicken, a Scotch fillet steak, chicken schnitzel, double helping of bacon and a double serving of cheese. Then they like to pile it straight up. Then they like to eat it. Then they die. 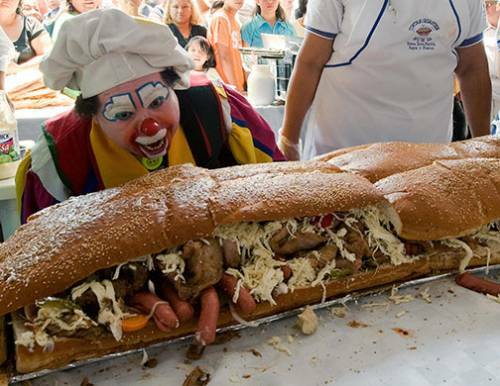 And then you have this: apparently someone made a REALLY BIG Submarine sandwich – then they got a Clown look it over and make everyone close by uneasy. If you eat near a Clown, you are on your own. ‹ Buffalo Chicken Wing Cupcakes! Recipe For Delicious!